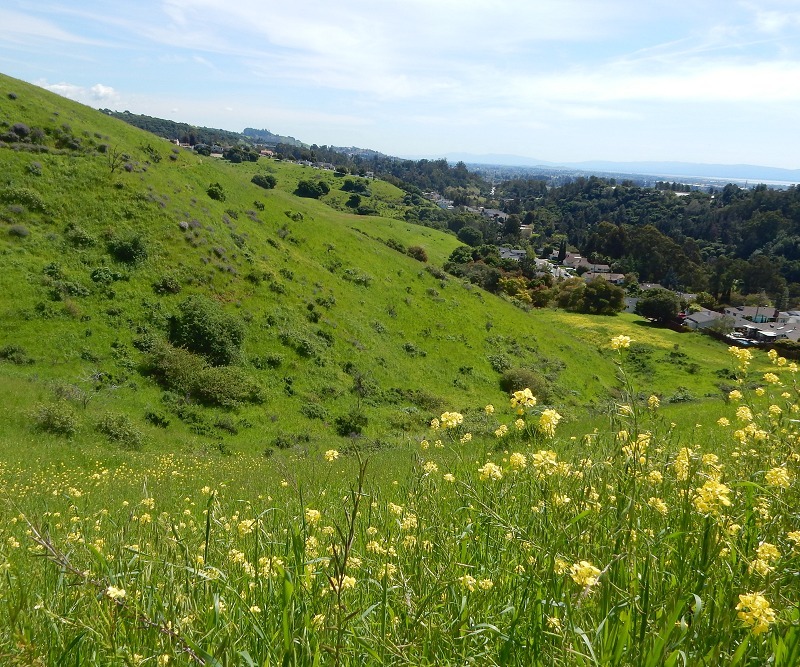 King Estates Open Space is mapped as ancient alluvium, and the soil supports a typical crop of imported and indigenous plants. At the moment, green prevails, punctuated by blossoms of our native poppies and invaders like mustard. Yellow blooms that I think are mule-ears have begun. It’s still early for irises and blue dicks, but lupine is on display. 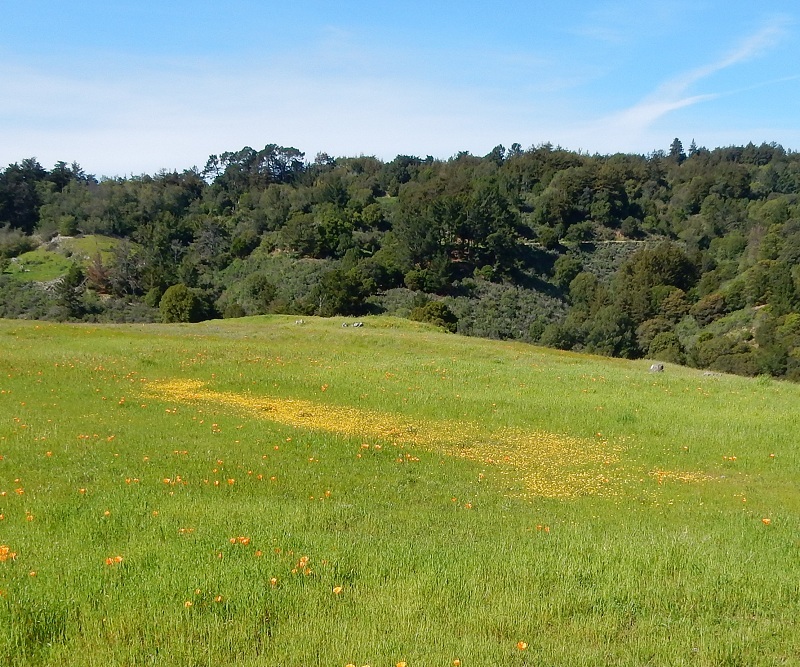 Knowland Park is in similar shape. Even the rugged boulders of Knoxville Formation conglomerate are clothed in green. 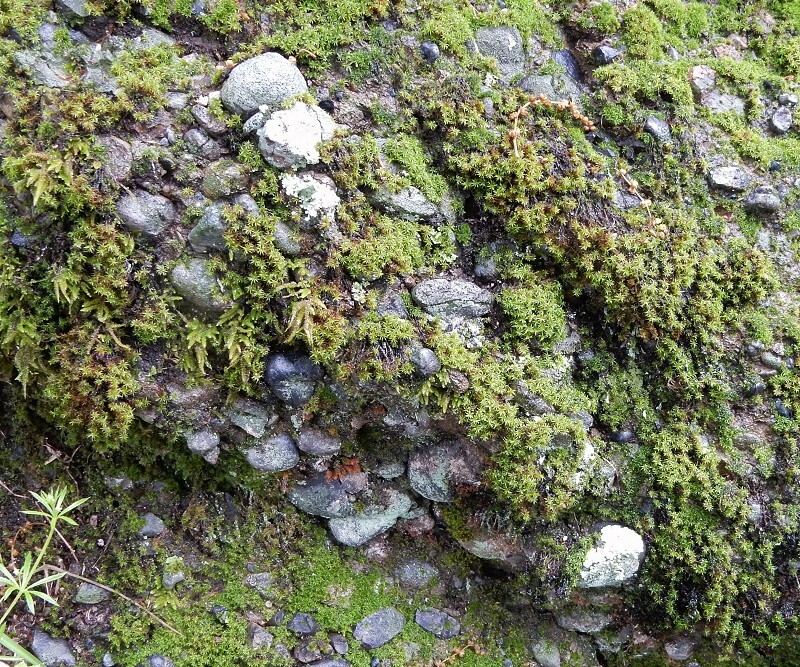 Over at Serpentine Prairie, the unusual serpentinite bedrock supports a whole habitat of specialist plants. 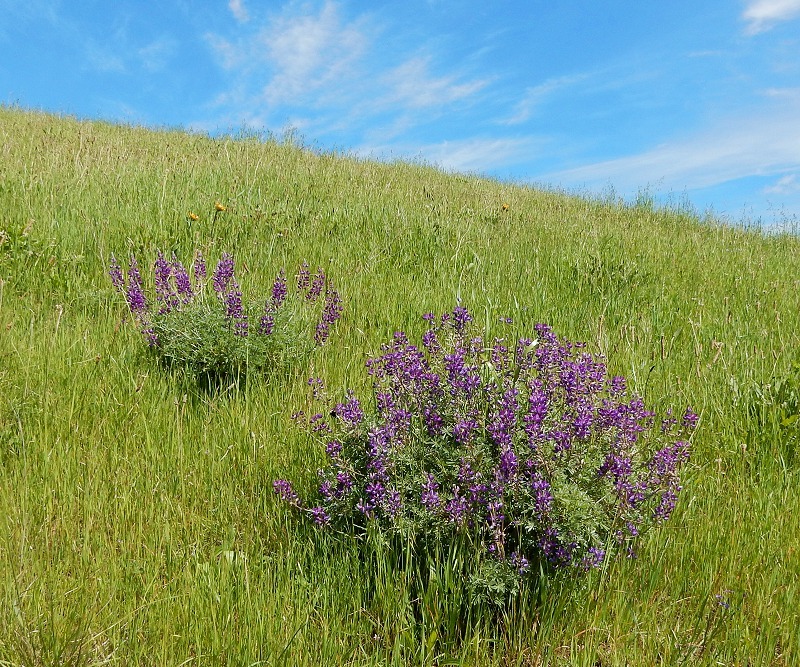 Attentive management by the East Bay Regional Parks District is gradually mitigating decades of neglect, and the meadow has a distinctive color and texture. 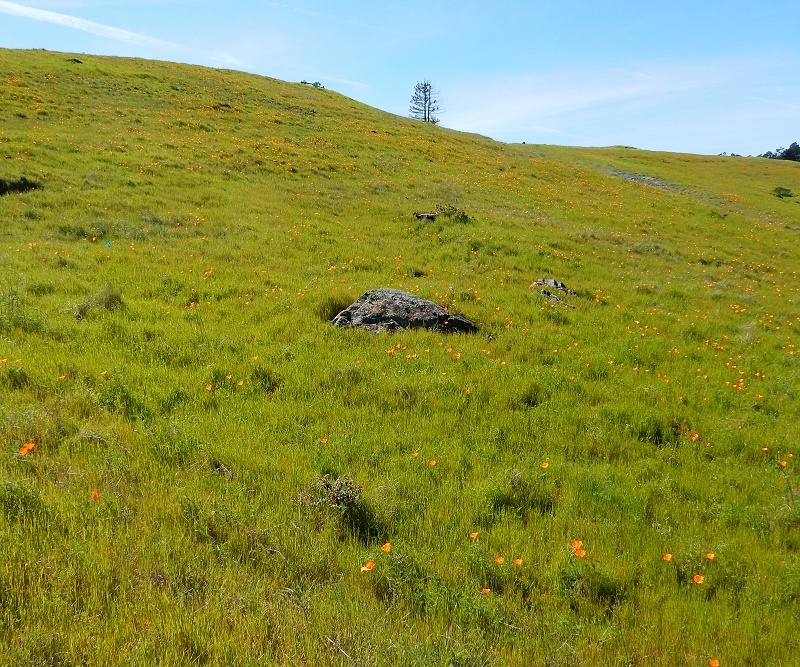 The poppies grow differently there — smaller and more isolated. I don’t know what the white flowers are in this picture . . .
. . . but I do know goldfields, which are just starting in the driest flats. The rare Presidio clarkia is still a few months away. 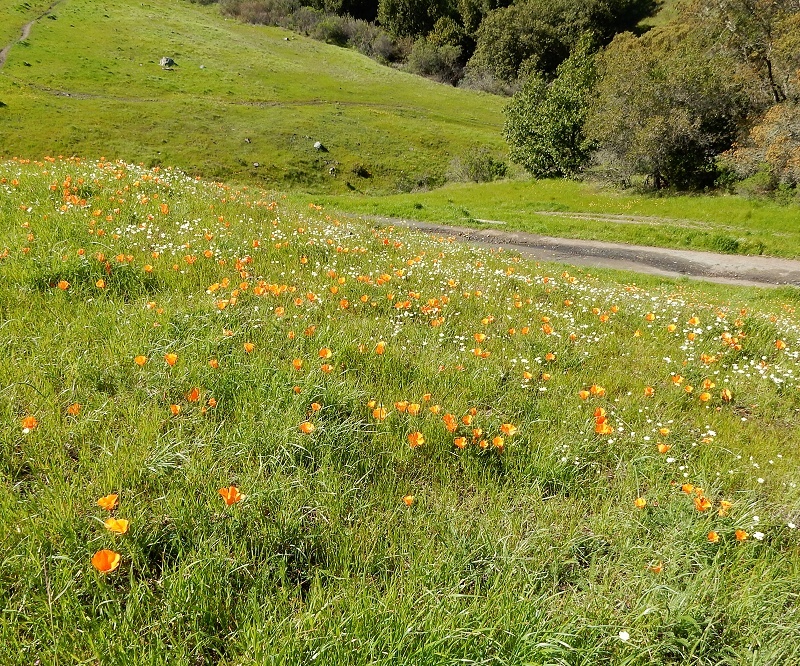 Get out there and see our local wildflowers. Like the song says, these are days you’ll remember. Wherever you go, though, beware our poison oak, which is also having a banner year. 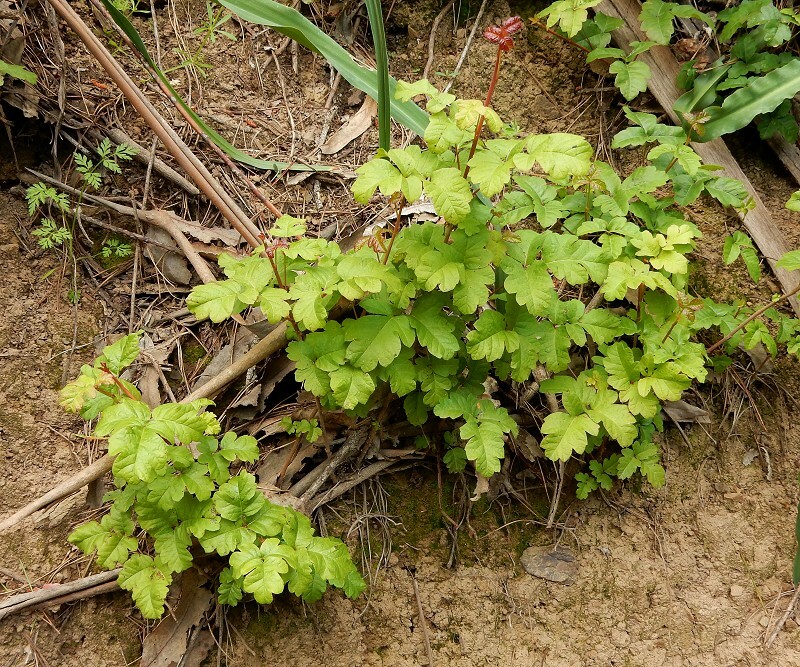 Having just recovered from a case of poison oak rash, I’ve had this plant on my mind lately. I wish our two species could be friends, but apparently Toxicodendron diversilobum has singled out humans for torment and causes other animals no problem. Poison oak has a lot to commend it: it’s hardy, versatile, fast-growing, has attractive glossy leaves and produces berries. We can remove it from limited areas using herbicides and elaborate protective gear, but eliminating the species is impossible. I see two long-term solutions. The first is to genetically engineer the whole Toxicodendron genus to no longer produce its irritating oil, urushiol. The second is to genetically engineer ourselves so urushiol stops working on us. I would sign up for that today. I think it’s more ethical to modify ourselves than to modify a wild species, unless that would save it from extinction. What could possibly go wrong? All I can think of is that places protected by poison oak today would start to suffer from human invasion. We’d have to give the plant a new name once it’s not poisonous. And who knows, maybe poison-oak berries are good eating. This entry was posted on 28 March 2016 at 8:03 am and is filed under Other topics. You can follow any responses to this entry through the RSS 2.0 feed. You can skip to the end and leave a response. Pinging is currently not allowed.